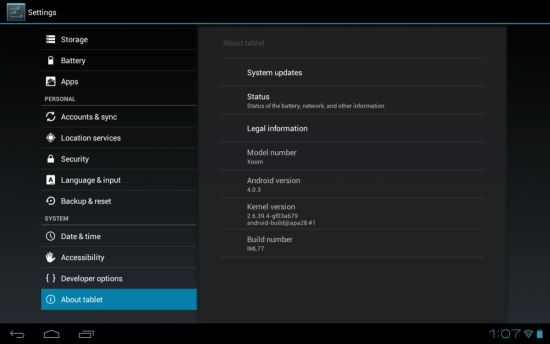 The soap test that the small batch of Motorola XOOM tablet devices had been subjected to seems to have worked out well enough to justify rolling out the Android 4.0 ICS update for all Wi-Fi only users of the XOOM. The update right now is available only to XOOM tablet users in the US, making it just the second device so far to be upgraded to Android ICS. The Transformer Prime is the first tablet to be provided with the Android ICS update, though the XOOM tablet had been the first to sport Android Honeycomb. The reason why Android 4.0 is so in demand stems from the fact that it has certain inherent features which render it more user friendly than its previous versions. For one, there is spell check feature available now, and the option for removing applications or adding contacts. That the latest Android version is also equally applicable to both Smartphones as well as tablet PCs is one of the biggest USPs of Android ICS. The update is being released OTA, though one can also try it out manually by selecting Settings menu -> About tab followed by tapping on System Updates options. The XOOM never had a good run at the market and one reason for that has been its insanely high price tag. Motorola, though, has already taken care of that and now with the XOOM tablets being Android ICS compliant, it should add to its appeal. Meanwhile, in other XOOM tablet news, Carphone Warehouse is now offering the Motorola Xoom Wi-Fi only version in UK for just 249.99GBP, down from the earlier selling price of 299.99GBP. Add to this the update to Android ICS that should reach the UK soon and what you have is a decently speced tablet running the latest Android version. 3G and 4G enabled version of the XOOM will have to wait some more for the Android ICS update.